Sen. Lisa Murkowski has made headlines of late for her push to open part of the Arctic National Wildlife Refuge to oil and gas exploration but she’s also using her position in the Senate to angle for more resource activity in Southeast Alaska. Murkowski chairs the Appropriations subcommittee covering the Interior Department, the Environmental Protection Agency and the Forest Service, which released its $32.6 billion discretionary 2018 budget for those agencies Nov. 20. The budget bill also includes provisions that would force the Forest Service to, at least temporarily, stop its transition to young-growth timber harvest in the Tongass National Forest and once-and-for-all exempt Alaska from the Roadless Rule. Specifically, the Tongass provisions would require the Forest Service to start the process to amend the 2016 Tongass Land and Resource Management Plan by Jan. 31 of next year. The current Tongass plan — an environmental impact statement — took effect last December and directs forest managers to fully transition to only young-growth timber harvests in the Tongass within 16 years. It was spurred by a 2013 memo from then-Agriculture Secretary Tom Vilsack directing management of the forest to be more ecologically, socially and economically sustainable, while accelerating the transition to predominantly young-growth timber harvest by the region’s remaining timber industry. Managers would revert back to the 2008 Tongass plan while the 500-plus 2016 plan is amended. As part of the management plan changes, the budget bill also directs the Forest Service to conduct “stand-level” inventory of the roughly 360,000 acres of young-growth timber stands in the 17 million-acre Tongass to determine which stands are mature and harvestable and incorporate the results of the survey into the 2016 plan revision. It authorized $1 million to the Forest Service to conduct the fieldwork and another $700,000 to amend the Tongass management plan. Tongass Forest Service spokesman Paul Robbins said via email that the agency couldn’t speculate on the pending legislation, but said the Forest Service spent $5.5 million over multiple years developing the 2016 management plan. Murkowski and Alaska logging industry leaders have consistently said they support moving to strictly young-growth harvests in the Tongass but doing so would require a gradual shift over 30-plus years to allow young-growth stands to mature. Loggers contend the trees in many of the young-growth stands simply aren’t large enough for Southeast’s remaining mills — originally designed for large, old growth logs — to process. Currently, much of the timber harvested from the Tongass and state and private lands in Southeast is exported to Asia as whole, saw logs and is not processed in state. Murkowski has said if the federal government is not going to subsidize the millions of dollars of equipment changes mills would need to make to accommodate smaller logs the young-growth transition needs to be slowed to allow the trees to grow. According to Alaska Forest Association Executive Director Owen Graham, it takes roughly 90 years for a timber stand in the Tongass to reach harvestable size and the management plan in place now would kill off what’s left of Southeast’s timber industry. At its peak in the 1980s, logging in Southeast supported nearly 4,000 jobs in the region, according to Graham. Today, there are about 300 timber-related jobs in the region. Conservation and commercial fishing groups insist the expedited young-growth transition more aptly matches the reality of Southeast’s current economy. 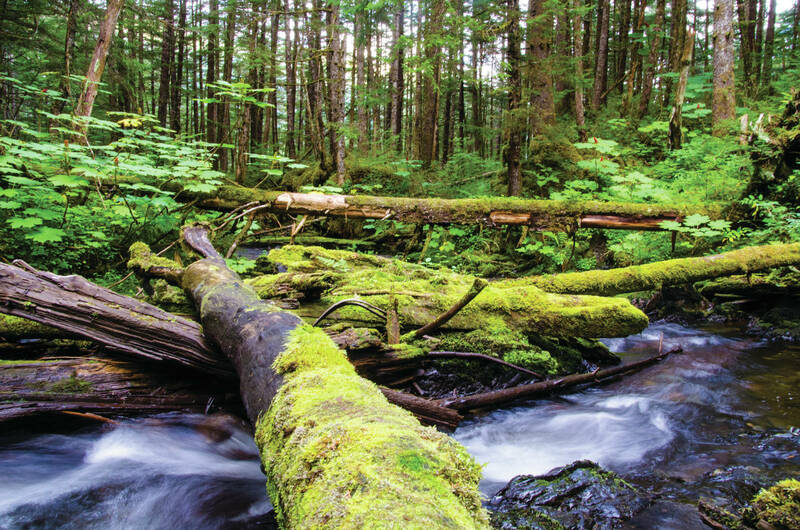 Limiting the new areas available for logging protects salmon habitat and also benefits the region’s visitor industry — one of the few growing sectors of the state’s economy — which markets the pristine environment of the Tongass, the contend. “The (2016) Tongass plan amendment is the product of years of collaboration by Alaskans from across the political spectrum that were able to overcome their differences and form a shared vision for the Tongass based on tourism, fishing and sustainable young-growth forest products,” Trout Unlimited Alaska Legal Director Austin Williams said. “It is disheartening that Sen. Murkowski is turning her back to the thousands of Alaskans that support the Tongass plan amendment and threatening to return the region to the conflict and divisiveness of the past. In 2016, the commercial fishing and tourism industries collectively supported 21 percent of the jobs in Southeast, according to the Southeast Conference, the region’s lead economic development organization. With the State of Alaska and timber industry supporters so far unable to reverse the Roadless Rule after years in court, Murkowski’s budget bill would nullify it in Alaska. The Roadless Rule, enacted by the Forest Service in 2001 under President Bill Clinton, prohibits development on roughly 58 million acres of previously undisturbed national forest lands nationwide. In the Tongass, the nation’s largest national forest, the rule set aside about 9.6 million acres, according to the Southeast Conference. While the Roadless Rule does not explicitly prohibit logging in the qualified areas, it limits loggers to using helicopters to remove felled timber, which can be exceedingly expensive and therefore ostensibly prohibits activity in Roadless areas. Much of the focus is on its impacts to the Tongass and Southeast Alaska, but the exemption would also apply to the 5.4 million-acre Chugach National Forest, the second-largest national forest behind the Tongass. Comparatively little logging has occurred in the Chugach, but Roadless opponents note the rule also prevents isolated rural Alaska communities in the forests from developing hydroelectric projects that could supply cleaner, lower cost energy. Alaska’s congressional delegation has long sought an exemption from the rule for the state if it couldn’t be repealed entirely. In 2003, George W. Bush’s administration did exempt Alaska from the Roadless Rule to settle a lawsuit brought by the state. However, in 2011, a U.S. District Court of Alaska ruling overturned the exemption in a lawsuit filed by Alaska Native and conservation groups against the Forest Service. The state intervened and appealed the ruling to the 9th Circuit Court of Appeals and won in a three-judge panel ruling in March 2014 to have the exemption reinstated. But in July 2015, a full, 11-judge 9th Circuit ruling reversed the 2014 decision and again put the Roadless Rule in effect in Alaska. The U.S. Supreme Court declined to hear the state’s appeal in the case last year. Most recently, on Sept. 21 a federal District Court judge for the District of Columbia dismissed with prejudice a separate State of Alaska lawsuit claiming the rule was enacted illegally. The state Department of Law appealed that ruling to the D.C. Circuit Court of Appeals Nov. 6.